HERNDON, Va., February 8, 2010 — Volkswagen of America, Inc. today announced the debut of the new 2012 Jetta GLI, which combines the comfort and sophistication of a Jetta with aggressive performance and handling in a sporty yet sleek package. The all-new Jetta GLI is the most differentiated Jetta GLI model ever made by Volkswagen. With a rich heritage that dates back to 1984, the new Jetta GLI is sure to appeal to both automotive enthusiasts and everyday drivers alike. The Jetta GLI offers exceptional features and options, for equally impressive pricing. Available in three trim levels, the Jetta GLI has a starting MSRP of $23,495. 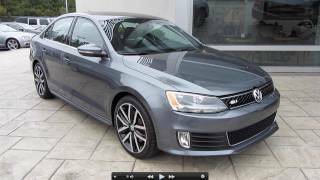 The GLI Autobahn, with an MSRP of $25,545, adds 18” alloy wheels, sunroof, dual zone climate control, heated V-Tex Leatherette seats and the Fender® Premium Audio System. 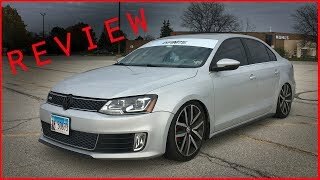 The top of the line Jetta GLI Autobahn with Navigation adds the RNS-315 navigation system and keyless access with push-button start technology for an MSRP of $26,445. The sporty Jetta GLI boasts the award winning 2.0L turbocharged four-cylinder gasoline engine, generating 200 horsepower and a full 207 lb.-ft. of torque at just 1,700 rpm, contributing to drivability and response of the vehicle in both everyday and performance situations. 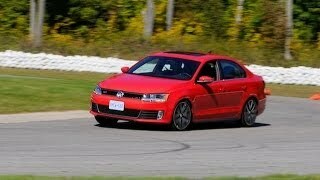 The Jetta GLI is offered with a six speed manual transmission as standard equipment. This new model is significantly lighter than the previous Jetta GLI and it offers power and performance coupled with German sensibilities. While EPA figures are not yet available, the Jetta GLI is expected to deliver 31 mpg highway with the manual and 32 mpg highway with the DSG® automatic. To make life on the road a little easier, the Jetta GLI offers sophisticated, German engineered premium appointments. Features include standard 6.5” touch screen premium VIII radio with Bluetooth and iPod connectivity, standard one-touch up/down power on all four windows, standard multifunction display (for vehicle status, trip, radio and navigation information when equipped), available dual zone climate control, available RNS-315 navigation system and available keyless entry with pushbutton start. 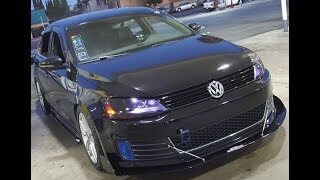 The 2012 Jetta GLI Autobahn and Autobahn with navigation models come standard with a Fender® Premium Audio System, bringing the concert stage to the vehicle for the ultimate music experience. Designed exclusively for Volkswagen, the Fender® Premium Audio System is embedded in the vehicle design and features proprietary Panasonic® speaker technology. The system covers the cabin with directional sound from front door speakers that generate imaging beyond the capabilities of traditional speaker designs. It cuts through the noise and other distractions with front dual voice coil speakers, with extended range for all musical genres. The sound system features lower inter-modulation distortion and smooth mid-range response to eliminate harshness. It is harmonically complex, with extended range tweeters and properly voiced 16cm speakers revealing original instrumentation timbre and harmonic richness, bringing the raw emotion of live music to the driving experience. The Jetta GLI combines performance, space and comfort in one sleek package. At 182.2 inches long, 57.2 inches tall and 70 inches wide, it is more than 2.9 inches longer than previous Jetta models. The front end of the car is defined by prominent horizontal lines. The Jetta GLI grille and the car’s trapezoidal headlights help create a distinct look. Below the bumper is a cooling air intake and tray-shaped front spoiler that completes the masculine look of the car. The upper front end section shows a powerful transition from the v-shaped engine hood to the fenders on the sides while the shoulder section provides dynamic and muscular styling. The aggressive styling of the Jetta GLI is powerfully emphasized by the arches of the wheel wells available with 17” or 18” alloys. Sleek lines and sporty shoulders dominate the rear section. The smoked taillights stand out with two distinct sections extending on either side from the fender into the tailgate above the dual exhaust tips. Like the exterior, the interior of the Jetta GLI stays true to its sport and performance roots. Featuring sport bucket seats with red stitching and a sport flat-bottom steering wheel with red stitching, the GLI logo and aluminum accents, the interior styling consistently follows the clean, sporty lines of the car. The Jetta GLI is available in cloth or V-Tex Leatherette and also features sleek alloy pedals, shifter, dash and door trim. Intuitive controls and well-arranged instruments allow drivers to enjoy a comfortable and ergonomically designed gear shift grip. Further up on the center console are the newly designed and intuitive controls for climate and radio. The console is also slightly inclined toward the driver to heighten comfort behind the wheel. To increase versatility, the rear bench seatback is split 60/40 and folds. The trunk can also be opened from inside the car by a remote unlock switch. The Jetta GLI includes several features designed to enhance driver and passenger safety including electronic stability control, tire pressure monitoring and Volkswagen’s advanced Intelligent Crash Response System, which initiates automatic safety protection in some types of collisions — the electrical supply to the fuel pump is shut off, the doors unlock and the hazard lights switch on. As part of the equipment package, the Jetta GLI also features driver and front passenger airbags, side airbags in front and Side Curtain Protection® airbags in front and rear.